Coats of Arms or Family Crests can trace their early origins to the symbols and decorations on the shields and tunics of medieval knights. Indicative of a knight’s ancestry, accomplishments, and distinctions, these Coats of Arms were passed down from generation to generation, serving as a proud symbol of the family’s history, identity, and unity. Rampant Lion Collections® utilizes their research library of original recorded Coats of Arms for over 2,000,000 surnames of European ancestry to locate your family Coat of Arms. 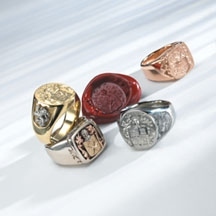 Signet rings deeply engraved with these Coats of Arms acted as seals by leaving a relief impression of the Coat of Arms in sealing wax to both mark and authenticate documents and communications. At Rampant Lion Collections®, master engravers, at the peak of their profession, use hand graver tools to artistically hand-cut all Coats of Arms just as they did in the Middle Ages. 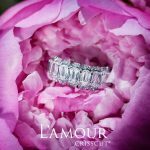 With innovations like comfort-fit ring shanks, tri-color gold applications, hidden carved rampant lion logo, shield-shaped gemstone and gold nugget inlays, and a library of hand-sculpted appliqués of heraldic symbols, Rampant Lion Collections® brings you their “finest in the world” signet rings that set the standard by which all heraldic jewelry is measured. Start your family tradition today with a Coat of Arms signet ring by Rampant Lion Collections®!